Gaffer Tape is a residue-free tape that conforms to irregular surfaces, is easily tearable and has excellent water, vapor, and abrasive resistance. 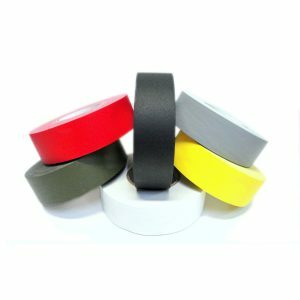 Our Standard Grade Gaffers Tape is ideal for most applications. If you’re looking for a low glare cloth finish, please see our Premium Cloth Gaffers Tape. Also available is our Premium Cloth Fluorescent Gaffer Tape. Gaffer tape is also known as spike tape, gaf tape and av cord tape.